Turbine HPW80-B is assembled on a derivation made upstream sluice valve controlling the water level in the reservoir. The flow is limited to 15 m3/h (4 l/sec) by a diaphragm. 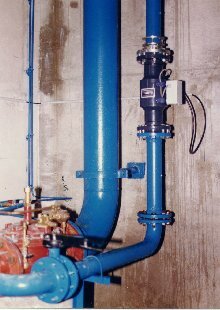 The turbine functions during 10 to 12 hours per days, mainly when the sluice valve is closed. Hydraulic connection is made by two supports DN80.